I'm on a Middle Earth kick if you haven't noticed. 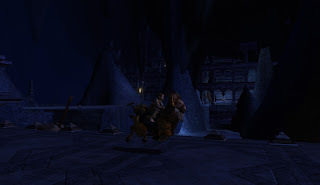 So it was only a matter of time before I logged into Lord of the Rings Online. It's been over a year since I've played the game. After playing so many console games and then Guild Wars 2, Lord of the Rings Online certainly shows its age. But it's still a pretty game and coming back to it is like riding a bike. It took a few moments and then was almost like I never left. That is, if you ignore the occasional button pushes work in Guild Wars 2 but not Lord of the Rings Online and leave me temporarily confused. So today was a good day. One in which I get to run around as a hobbit. And today, as you can see, I was a hobbit ridding a goat through the halls of Moria. That's not bad, as far as I'm concerned.